$2 billion to add lanes to the Van Wyck while the transit system slowly fails, but at least we have USB ports on buses. If the transportation budget he released this week is any indication, Governor Cuomo is serious about spending $1.5 to $2 billion to add lanes to the Van Wyck Expressway and its interchange with the Grand Central Parkway, part of a $10 billion overhaul of JFK Airport. Cuomo has allocated half a billion dollars for FY 2018 to get the project started. As Cuomo sees it, he’s going to “save motorists a combined travel time of 7.4 million hours annually going to and from JFK,” improve air quality around the highway by reducing emissions by “an estimated 30 percent,” and keep airport-bound traffic off neighborhood streets. But make no mistake — this is a highway widening that will cost a ton of money and increase traffic. The notion that adding lanes will reduce local traffic or improve air quality runs counter to everything we know about how highways work. Empirical experience shows that adding lanes to congested roads leads more people to drive, until the road is congested again. Even if the new lanes prioritize buses, they will still make room for more cars and lead to more traffic in the long run. Those car trips won’t begin and end on the highway — they will burden local streets too. Ask most New Yorkers how they would spend $2 billion on transportation, and faster highway trips to JFK would probably rank far down the list. The real crisis facing the city is its strained transit network — the subways constantly delayed by signal failures and overcrowding, the buses slowed down by traffic and an antiquated fare system. Cuomo could do far more for New York by shifting his attention and budget resources to address these core problems with the transit network. Even accepting the premise that the Van Wyck should work better for airport trips, other options could be explored, like converting an existing lane to exclusive use for buses, vans, and high-occupancy vehicles. But Cuomo has jumped right into highway expansion mode. They should have thought of this when they built the air train a few years ago. They could have built a 4 lane wide viaduct with two tracks and two HOV/Bus lanes for probably not that much more than just the air train. I wonder if they will skip the EIS on the grounds that these are “auxiliary lanes.” Meanwhile, we need more “community review” of bike lanes. By the way, I wish the idea that money spent on this is lost to possible spending on that when all those “free” retroactive pension increases were enacted between 1992 and 2008. They were only “free” in that much of the cost has not yet been paid. And free for those who planned to be dead or in Florida before most of the real damage took place. I don’t see how another lane fits, frankly. Unless they are prepared to swallow the service roads. They could cantilever the service roads over the extra highway lane. Cuomo really knows how to spend megabucks $$. 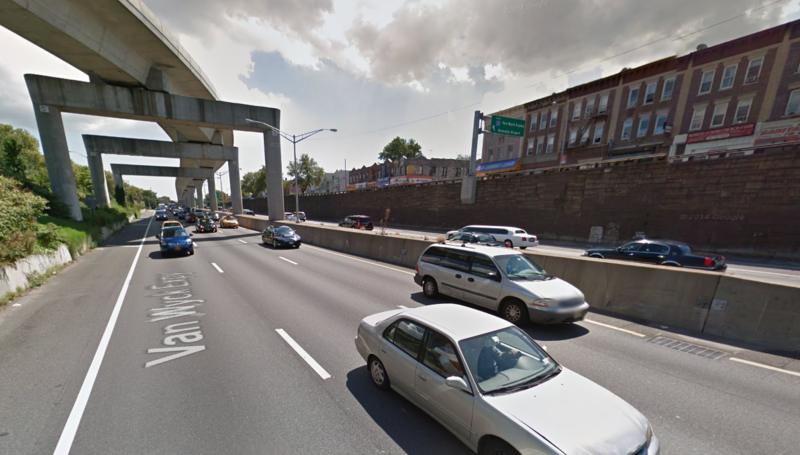 I was assuming the whole thing would be elevated over the Van Wyck. Why not dedicate this funding to improved mass transportation access to JFK? I imagine that a large portion of those cars you see sitting in traffic everyday are coming to and from the airport. If you used that money to extend the subway to the terminals, many people wouldn’t bother with substantially more expensive cabs.